2016 Kia Optima Pros and Cons: Why (Not) This Car? Kias used to be cheap cars. But Kia works even harder to improve its products than sister company Hyundai does, and for 2013 began offering its Optima midsize sedan in upscale "SX Limited" form. My impressions of that car were mixed. It was boldy styled and upholstered with premium hides, but lacked refinement. For 2016, the Optima has been fully redesigned. Pricing starts at $22,665, but once again I tested the SX Limited. The Optima SX Limited's $36,615 sticker, sportier-than-a-Malibu character, and upscale trimmings led me to raise my sights (when targeting Nissans) from the Altima (only a few percent of which are bought with a V6) to the $38,750 Maxima SR.
Has Kia's Camry, Accord, and Altima competitor improved enough to play out of its league? Nearly passes as upscale. Steering wheel hub and center console trim don't contribute. Why the 2016 Kia Optima? Getting the obvious out of the way, while $36,615 seems excessive for a Kia Optima, it is less than $38,750. Plus the Optima SX Limited has quite a few features you cannot get on a Maxima SR, most notably a panoramic sunroof, memory for the driver seat, and an around-view camera system (all of which are only offered on the less sporty and more expensive Maxima Platinum). All in all, the Optima SX Limited has over $2,000 in additional content. Adjust for this, and its advantage exceeds $4,000. If you don't need the SX Limited's upgraded interior trim or around-viem cam, the Optima SX (non-Limited) with the Premium Technology Package lists for $1,300 less. While $400 more than a Nissan Altima SL (with Technology Package and floormats), the $35,315 Kia includes about $2,500 in additional content. A loaded Hyundai Sonata includes slightly fewer features at a slightly lower price. While a loaded Kia Optima certainly isn't cheap, it seems a good value when content is taken into account. As noted above, the Kia Optima SX Limited is exceptionally well equipped for a volume-brand midsize sedan. If you can get a particular feature on a competing sedan, it's almost certainly standard here. Passengers especially enjoy more amenities in the Optima. The Maxima's front passenger seat adjustments include only fore-aft and recline. The Optima's adds height, tilt, and four-way lumbar. The Optima's rear passengers can take advantage of seat heaters in the winter and sun shades in the summer. The Maxima offers neither feature. The Optima's rear seat can do one more thing the Maxima's cannot: fold to extend the trunk. Beyond individual features, you can get the Optima in the sporty upscale form that warranted a comparison with the Maxima in the first place. The Chevrolet Malibu, Honda Accord, and Subaru Legacy ranges include no equivalent. With the Altima as well as the Maxima some upscale features aren't offered on the sporty "SR" variants. The Mazda6 isn't offered with more than 184 horsepower. The Optima does lack one significant feature, though: unlike a few competitors (Buick Regal, Chrysler 200, Ford Fusion, Subaru Legacy) it isn't offered with all-wheel-drive. The C-pillar continues to be the most interesting part of the exterior. Third window moved off door. The new instrument panel might be less interesting, but it's ergonomically superior. The new Kia Optima, like the related Hyundai Sonata, is offered with a full array of safety tech and aced its crash tests. The Maxima also aced the crash tests, but unlike the Koreans didn't come to a complete stop in both automatic braking tests. Like all Hyundais and Kias, the Optima has a 5/60 basic warranty and (for the original owner) a 10/100 powertrain warranty. The Maxima has a 3/36 basic warranty and a 5/60 powertrain warranty. I've gotten this far into the review without touching on what the new Kia Optima is like to drive. Well, compared to the previous Optima the 2016 rides and handles with far more polish, composure, and control. Dips and bumps that upset the 2013 don't faze the 2016. Unlike with the 2013, the harder you drive the 2016 the better it feels (within the modest limits of the all-season tires). Kia is serious enough about the handling of the Optima SX (and SX Limited) to fit it with a completely different, more expensive steering system. While a column-mounted motor assists the steering of regular Optimas, the SX has a rack-mounted motor like that of premium European sedans. Mounting the steering-assist motor on the rack tends to improve feel, and the Optima SX's steering is about as linear, precise, and communicative as you'll find in this class. It also has more heft than most and feels especially tight on-center in sport mode. This steering in conjuction with additional nuanced feedback through the seat made the Optima SX much more engaging than the Chevrolet Malibu I drove the following week. The Maxima's steering, though sporty in its quickness, feels overinsulated in comparison to the Optima's. When fitted with optional ($450) high-performance Bridgestone Potenza RE050 tires, though, the Maxima SR grips the road better. Kia should offer a high-performing tire option on the Optima. Currently the top trims are offered only with the Michelin Primacy MXM4, a good touring tire. Though Hyundai employs the same hardware in the Sonata 2.0T, it didn't tune this hardware as well. The Sonata isn't as polished or as engaging. The Mazda6's steering communicates at at least as well as the Optima's, and it handles with more agility (a 200-pound-lower curb weight helps), but it doesn't feel as solid or as refined. Why Not the 2016 Kia Optima? As turbocharged four-cylinder engines go, the Kia Optima's 2.0-liter performs pretty well. Though horsepower is down from the previous generation's 274 to 245, the revised engine is significantly smoother and quieter. The problem with this engine: it doesn't approach competing V6s in subjective or objective performance. It doesn't sound or feel nearly as good as the Maxima's 300-horsepower V6, and takes another second-and-a-half to get to 60 mph (figure 7.5 vs. 6.0). Despite being down over 60 horsepower, at full-throttle the Mazda6 is as quick. (The Mazda doesn't feel as strong in typical daily driving, though.) To fully warrant its positioning and price, the Optima SX Limited needs a stronger, more thrilling engine. 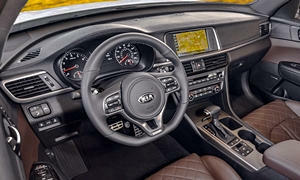 It helps that the Kia's six-speed automatic generally performs well and (if such a thing is desired) responds fairly quickly to manual inputs via the shifter or steering wheel-mounted paddles. Selecting sport mode noticeably increases the responsiveness of both the engine and transmission, nearly eliminating the modest amount of lag present in the other modes. The Kia Optima SX Limited's suspension, though it absorbs medium-to-large bumps well, can feel somewhat jittery over not-quite-smooth roads. The Maxima doesn't feel jittery but rides more firmly. Wind noise levels are very low in both cars. Road noise levels aren't nearly as impressive in either car. In the Maxima the tires clomp across even the small stuff. The non-SX Optimas likely ride more smoothly. Abundant rear legroom, but scarce rear headroom. The 2011-2015 Kia Optima appeared stunning from some angles and awkward from others. The 2016 redesign has improved the car's proportions but cost it some visual impact and distinctiveness. I still find the Optima more attractive than most competitors. Yet some details remain in questionable taste. Why have "turbo" badges in faux fender vents? Why bother to paint small floating-type brake calipers red? The new Nissan Maxima's exterior styling is bolder and more distinctive, but some will find it ugly. The 2011-2015 Kia Optima's interior was even more bizarre than its exterior. With the 2016 redesign, the center stack is no longer aggressively canted towards the driver or outlined with upholstered parentheses. Kia's designers similarly cleaned up and conventionalized the center console. BMW appears to have been the primary inspiration. The resulting design, though less distinctive and less visually thrilling, is handsome and more ergonomic. The hottest current automotive interior trends involve stitching. One such trend, diamond-quilted seat upholstery, works well in the Optima SX Limited. Another, stitching embedded in the upper door panels and instrument panel, would work better if the material in which these panels are molded could convincingly pass as upholstery (it doesn't). I also recall a richer feel to the "nappa leather" in the 2013 SX Limited. 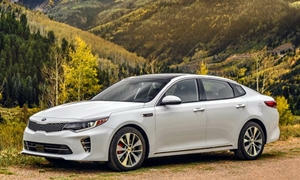 Overall, the Optima SX Limited's materials are worthy of its class, but not of the next one up. The Nissan Maxima SR's interior is more stylish and its materials are a little better. Its diamond-quilted seats have faux suede centers and its instrument panel and upper doors include stitching to better effect. The Kia Optima SX Limited's front seats, with their 12-way adjustability and quilted upholstery, promise to be very comfortable. Unfortunately, they aren't as plush as they appear. They provide decent comfort and support, but the Nissan Maxima's seats feel cushier and fit me better. I'd prefer a lower instrument panel and more open view forward in both cars. But at least the Optima's windshield isn't raked as aggressively as the Maxima's. The Kia Optima's rear seat passengers enjoy abundant rear legroom, about as much as they'll find in the class. But if they're over five-foot-ten most of their height better be in their legs, as headroom is in much shorter supply. The related Hyundai Sonata has a little more rear headroom. So does the Maxima, but it has a less comfortably positioned rear seat and less legroom. For a luxurious, fairly quick car, the Kia Optima SX Limited earns competitive marks in the EPA's fuel economy tests: 22 mpg city and 32 mpg highway. But the Maxima does nearly as well (22/30) while performing much better. The Altima V6's EPA ratings tie the Kia's. The Mazda6, while about as quick as the Optima 2.0T, scores much better: 26/38. In my suburban driving I was able to coax the SX Limited's trip computer average as high as 30 mpg. Still, those who have fuel economy as a top priority should opt for a different Optima. The LX 1.6T manages a very competitive 28/39. For an even higher city rating, wait for the 2017 hybrid. The 2016 Kia Optima SX Limited doesn't amaze in any particular way. The new styling is more restrained both inside and out, and doesn't grab the eye the way the Maxima's does. The Nissan's interior materials are also a little better. But a car doesn't have to be amazing to be excellent. I was impressed by the Kia's newfound refinement. The 2016 rides and handles much better than the previous Optima. Within the class, I prefer the Optima SX's steering to any other save the Mazda6. But the Mazda doesn't feel as solid or as upscale. So if you're seeking a car that is both engaging and thoroughly refined, a difficult combination to pull off, the new Optima tops its class. This led me to compare the new Optima to the Maxima, which is in the next class up. Technically the Maxima handles a little better. Especially when fitted with its optional performance tires the Nissan should easily beat the Optima around a track. But I preferred the steering feel and more engaging character of the Kia. The Maxima's largest advantage is its engine. Kia's turbo four doesn't approach Nissan's V6 in sound, feel, or performance, yet it isn't significantly more economical nor does it yield a lighter car. The new Optima is good enough to deserve a better engine. Given its current engine, to steal buyers from the Maxima the Optima SX Limited can fall back on Kia's traditional strength, a lower price. Sticker to sticker, the difference isn't large. But the Kia also includes considerably more content, so the feature-adjusted difference exceeds $4,000. Cheap, the new Kia Optima is not. But with the latest improvements (which contribute to top safety scores) it's an excellent value that I enjoyed driving. Not eye candy. A decent turbocharged four, but it doesn't compare to a good V6. As in competitors, a roomy trunk. Kia provided an insured car for a week with a tank of gas. Brian Evans (248-715-2062) of Suburban Nissan in Farmington Hills and Jim Cipriano (248-599-5923) of Feldman Hyundai in Waterford helpfully provided cars for comparison test drives. 2016 Kia Optima pros and cons, according to Michael Karesh: the best reasons for buying (or not buying) the 2016 Kia Optima. Join TrueDelta to post your own impressions. The lackluster drivetrain in the Optima consigns it to mid-pack in the competitive mid-sized segment in my opinion. While the 2016 Optima is significantly improved versus previous Kia offerings, the segment leaders haven't been standing still. In the past the Optima offered a lot of content for less money than competitors, but Kia's cost advantage has all but evaporated. A fully optioned SX Limited is close to $40K out the door. For a Kia? Any assessment of value needs to consider depreciation experience that is the highest cost of ownership. Brand cachet and depreciation with the Kia leave a lot to be desired. Depreciation concerns me as well. But it's possible that as the cars improve they'll depreciate less. Like it or not; reality is Kia suffers from a historical perception of negative quality and lackluster brand that yields poor resale. A car such as the Optima might be marginally cheaper to buy but more expensive to own because of the depreciation experience. As Kia retail prices have risen significantly over the past few years, depreciation needs to be a key element of anyone's purchase consideration of a Kia. With depreciation accounting for almost 50% of the five year cost of operating a car, how can the Optima be described as "an excellent value" without considering the largest real ownership cost factor? A car that costs less at the end of the day is what constitutes "an excellent value" in my assessment. In many cases, that's a car that might cost more to buy up front. If I follow my heart I say Mazda 6, but if I pay attention to my wallet it's hard to escape the economics of the superior resale value delivered by Camry or Accord.